Boston Health Care for the Homeless will open a room where drug users can get medical help in a nonjudgmental setting. Called the “SPOT,” short for a Supportive Place for Observation and Treatment, the space will be located in a first-floor former conference room, making it easily accessible from the street. It will be furnished with monitoring equipment and up to nine reclining chairs, and will be staffed by an addiction nurse and case manager. Visitors will not pay for the service or be required to give their names, and will be accepted on a first-come, first-served basis. Doug Anglin picked up a discarded syringe. Many emergency rooms and needle exchange programs have areas where people can rest while coming down off a high, but Boston Health Care for the Homeless officials believe it is the only place in the nation to supplement that service with medical monitoring. The site will not permit people to inject illegal drugs since that would violate federal law, although supervised injection facilities exist in several other countries. Instead, patients will be monitored and medical staff will intervene if needed, most likely with the overdose-reversal medication Narcan. Still, critics consider the move wrong-headed and counterproductive. In Massachusetts, opioids — including heroin, as well as prescription painkillers such as oxycodone and fentanyl — are now claiming at least 100 lives a month. Users often follow a familiar route from prescription drug addiction to cheap, potent heroin, which can be purchased for as little as $10 a hit. Meanwhile, demand for treatment far outstrips supply in the state, a problem worsened when the Long Island bridge closure in 2014 resulted in the shutdown of numerous shelters and addiction treatment facilities that had operated on the island. Boston Health Care for the Homeless’s overdose room was borne of a combination of practicality and desperation. Its staff was responding to overdoses two to five times a week in the building, and even more frequently outside. The organization began considering a so-called safe space for drug users after examining updated data on mortality rates for the city’s homeless population. “What we saw was shocking to us,” Gaeta recalled. Opioid use is now the number one killer of Boston’s homeless population, causing 80 percent of all deaths. That prompted the nonprofit to offer more addiction treatment services at its clinics throughout the city and prescribe fewer opiates for patients in need of pain relief. But overdose deaths continue to rise. Exacerbating the situation, hundreds of homeless residents and addicts displaced from Long Island were relocated to the neighborhood surrounding Boston Health Care for the Homeless, which sits at the corner of Albany Street and Massachusetts Avenue. Casey Leon of Boston Health Care for the Homeless Program used a flashlight to search for discarded syringes in a garage. 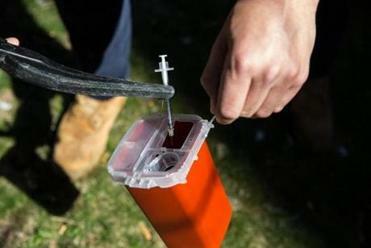 As a result, Gaeta and her staff — many of whom now carry Narcan at all times in case they encounter someone in distress — must increasingly respond to overdose emergencies, hampering the facility’s daily operations; it offers free primary care services, as well as counseling and psychiatry. A designated overdose room, they hope, will let medical personnel respond earlier and more efficiently, develop relationships with patients who may eventually seek treatment, and keep addicts from dying in alleys, on street corners, and in public restrooms. Many drug abusers, Gaeta acknowledged, will not be coherent enough to seek out the room, and are more likely to be walked into the site by friends, passersby, or medical personnel. News of the overdose room, which is meant for people in the immediate vicinity of the facility, is being spread mostly by word of mouth. 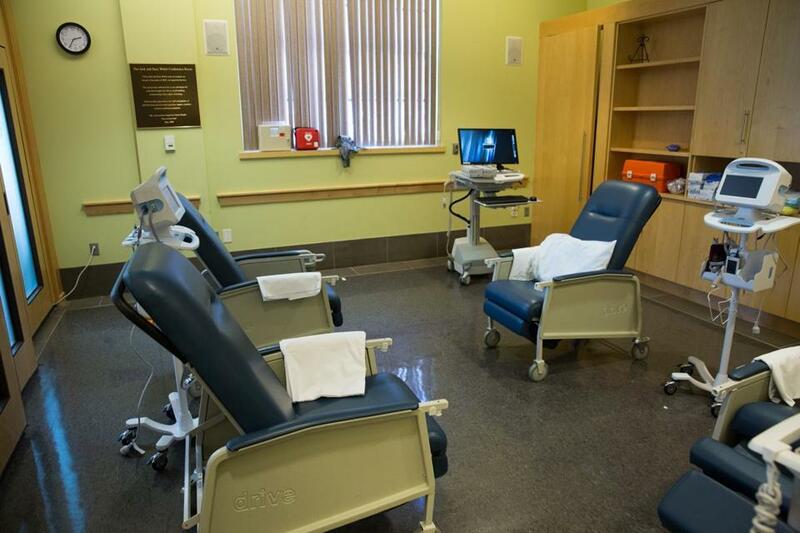 Bierer, an addiction specialist at Massachusetts General Hospital, dismisses concerns that the room could encourage poor behavior, citing studies showing that despite similar fears about needle exchange and condom availability programs, that didn’t happen. With the opioid crisis continuing to escalate, even some skeptics are willing to give the idea a chance. “Sure, let’s try it,” said John Hoving, a social worker at the Gavin Foundation, “but I just don’t see it as being one of the real solutions. Ron Hill, 68, a recovering addict who lives in Roslindale, shares those doubts. The chief executive of Boston Health Care for the Homeless, Barry Bock, said he is aware of those views and has been meeting with neighborhood groups to hear their concerns.